The show starts with a carnivalesque, Latin version of “Dreamland” (from 1977’s “Don Juan’s Reckless Daughter”), offered by Los Lobos. It turns out to be a pretty intoxicating affair with Chaka Khan chiming in towards the end before she takes over with her own version of “Help Me” (from “Court And Spark”, 1974). Chaka is planning her own Joni Mitchell tribute album and I think she is sounding pretty good on this performance. Let’s just hope that she can bring this supple, subdued color to her own project instead of simply shouting out lacklustre lyrics on boring songs on her latest, very poor release “Hello Happiness“. “Amelia” is next (“Hejira”, 1976), a perfect vehicle for Diana Krall who turns in a sublime performance and proves once again that she is much better off without the vast repertoire from the Great American Songbook. 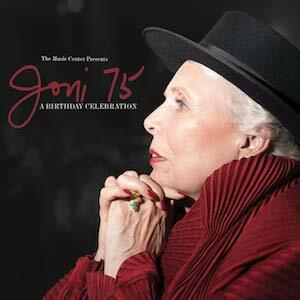 Her solo vocal (with piano accompaniment only) has some similarities to Joni’s art in terms of diction and phrasing. “All I Want” (from “Blue”, 1971) is one of two performances by Rufus Wainwright, the other being the title track of that pivotal album and with this ballad, Rufus’ real strength and empathy come forward. I don’t like Glen Hansard‘s version of “Cayote”. The former street musician sounds phony and exaggerated and it’s actually the only track where I longed for the original version (again from “Hejira”). A total contrast is James Taylor‘s tender, smooth and honest interpretation of “River”, one of so many pioneering songs by Frau Mitchell. Speaking of pioneering songs: “Both Sides Now” is one of the best examples how a single tune can bring out the best in an artist’s work: I think that Seal has never sounded better. We also get longtime friend Graham Nash with “Our House”, the song he wrote about the house in Laurel Canyon he shared with Mitchell back in the days. It must have been a thrill to have Kris Kristofferson on stage there as well. The 82-year veteran is teaming up with Brandi Carlile for “A Case Of You”. It’s pure nostalgia combined with poor pop churning and doesn’t really work. Carlile is certainly not worthy of Mitchell’s work, as proven on “Down To You” where her artificially gurgling, pathetic vocal literally hurts my ears. But relief is near: Norah Jones is in her prime with “Court And Spark” (she recorded the tune for Herbie Hancock’s Mitchell tribute in 2007) and I’m more than happy that at least one track from my favorite Joni album, the 1991 “Night Ride Home”, which is often overlooked, is featured here: “Nothing Can Be Done” by Los Lobos features Xochi Flores on vocals and sticks pretty close to the original, and wisely so. I like Emmylou Harris on “The Magdalene Laundries” (from “Turbulent Indigo”, 1994) where she is backed by the magic trumpet playing of Ambrose Akinmusire. Kudos by the way to musical directors Brian Blade (who worked with Mitchell for 15 years) and Jon Cowherd who also play drums and piano, respectively and to the brilliant musicians on stage, making Joni Mitchell proud I’m sure, since she always wanted the best: Chris Thomas on bass, Marvin Sewell and Greg Leisz on guitars, Jeff Haynes on percussion, and Bob Sheppard on woodwinds. After James Taylor’s “Woodstock”, there is the grand finale with “Big Yellow Taxi” where evereyone joins forces again to celebrate one of the icons of our time. As for the bonus tracks and as an encore, Norah Jones is back with “Borderline” for another sharp and witty performance and Diana Krall singing the intimate, atmospheric “For The Roses” is simply beautiful.